Our rainbow dyed lollipop sticks are making another appearance today with our rainbow color sort busy bag activity! We've been loving the busy bag activities we've been doing lately as part of a series with a group of kid activity bloggers and this rainbow color sorting busy bag is a new favorite in our house! Add this activity to your fine motor skills therapy toolbox! It's perfect for adding to your occupational therapy activities line up! We started with our rainbow dyed lollipop sticks (Seriously, these are awesome for so many play and learning activities! Make them!) and a stack of construction paper in matching colors. Cut the construction paper into rectangles and use clear tape to make small pockets. You want the lollipop sticks to fit in the pockets, but don't want them to be too large either. How pretty are those colors! My Little Guy really got into this busy bag activity. He liked to mix the lollipop sticks around on the table. "I have to shuffle them up, Mom!" and then sort the colors into the correct envelopes. 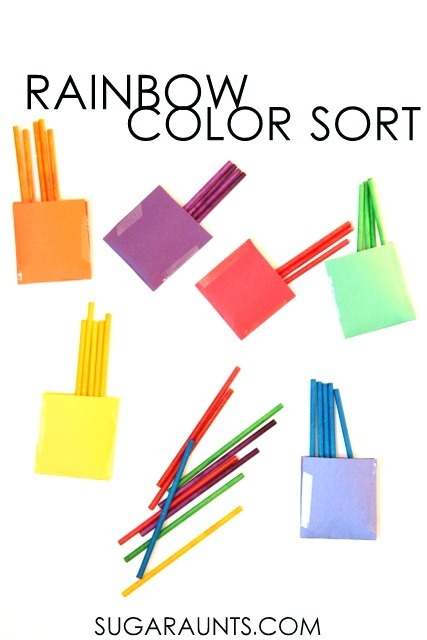 Other ideas to extend this activity would be adding numbers to count the correct number of sticks, sorting in rainbow order, only sorting certain colors, or sorting in a pattern order. I love that this busy bag activity can be done in so many additional ways to keep the little one's interested and busy!